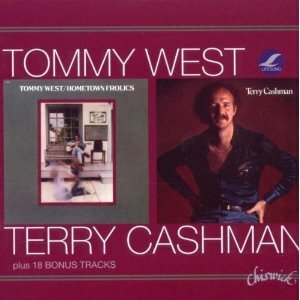 (2-CD set) Both Tommy West's Hometown Frolics and Terry Cashman's self-titled debut began as the fourth official Cashman & West album with the working title of Back To The Dawn. It was intended to be the first LP released on their new label, Lifesong, named after their third album for ABC/Dunhill. But the pair found themselves moving in different directions during Dawn's recording process, so two intensely personal and musically divergent albums emerged from the sessions instead of just one. Included on this package are previously unreleased Cashman & West outtakes such as the original attempts at Things Are Getting Better Now, I'll Sing For You, David And Dawn, and a very raw Back To The Dawn (whose rhythm section featured the rock group Crack The Sky), all of which reveal the process with which each of the solo albums began. They offer as much of a fly-on-the-wall's perspective as one can have on any recording project's history. For instance, one bonus track is the original version of Nightingale, an outtake from the album Lifesong, re-recorded by West for his solo project as a more upbeat country-rocker modeled during the pop-reign of the Eagles. Song For Jane, another Lifesong outtake, was a candidate for Cashman's project, but never made the final cut. Also included is the single version of West's I Know, a charting 45 that featured the artist on layers of later-added musical instruments. This collection not only presents the albums, but it also tracks the artists' careers after their solo album releases. In West's case, we get demos of songs intended for his follow-up to Hometown Frolics plus his reverent oldies recordings. In Cashman's case, we're offered his famous baseball recordings, all of which make a statement much bigger than a commentary on the sport; they reflect on father-son traditions, keeping alive memories of great achievers, and having role models one can admire for decades and beyond.